When pro-democracy protests started to get out of hand in China back in 1989, the tyrannical government sent in the military to crush the protesters. 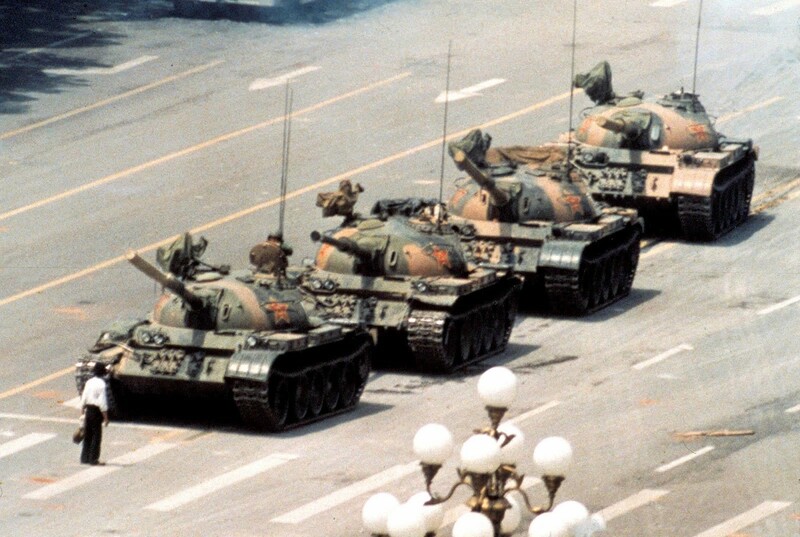 As the tanks bore down on them, one man stood in their way. There are conflicting stories about what happened to this man. Was he imprisoned and killed by the government? Did he get away? We don’t know for sure and the only thing we have left of him is this one picture of a courageous man standing alone against an evil empire. Johnny Cash was doing a show at San Quentin Prison when this photo was taken and the stories about it differ. 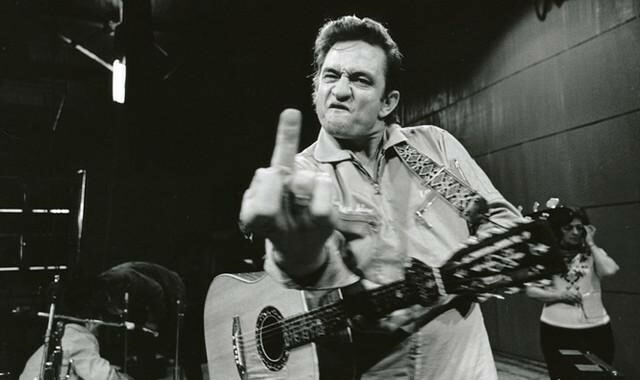 Some people believe he was flipping off photographer Jim Marshall for getting on his nerves, but Marshall said he asked Cash to show him what he thought of the warden and that was his response. Either way, Cash exemplifies rebellion and defiance of authority in the now iconic picture. This iconic photo captures the moment that sailor Glenn Edward McDuffie heard that Japan had surrendered in WWII. The story is even more bad assed than the picture. McDuffie had told the AP he was changing trains in New York when he was told that Japan had surrendered. “I was so happy. I ran out in the street,” said McDuffie, then 18 and on his way to visit his girlfriend in Brooklyn. 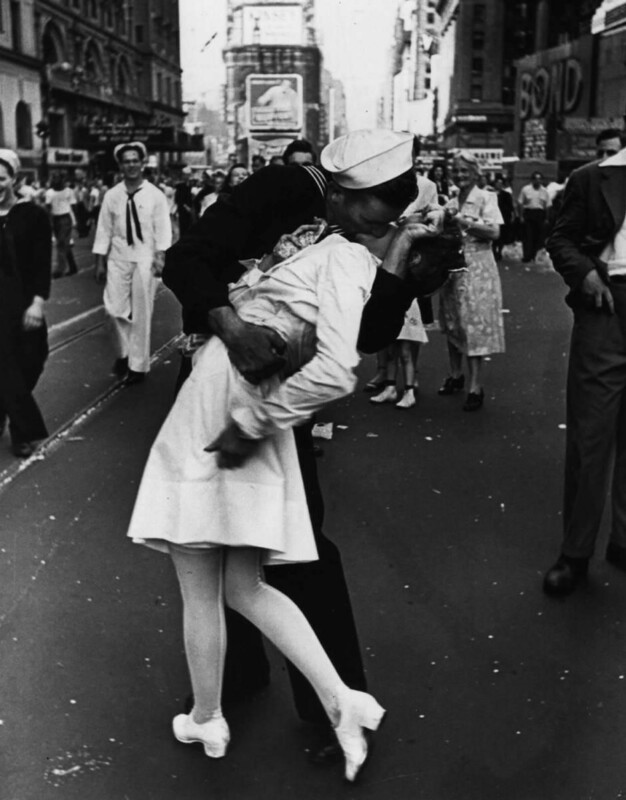 If McDuffie did that today, some feminist would accuse him of sexual assault, but what could be more appropriate than planting a manly kiss on a gorgeous nurse to celebrate final victory over the people responsible for Pearl Harbor? Even in 1936, defying Hitler in Germany could mean death. 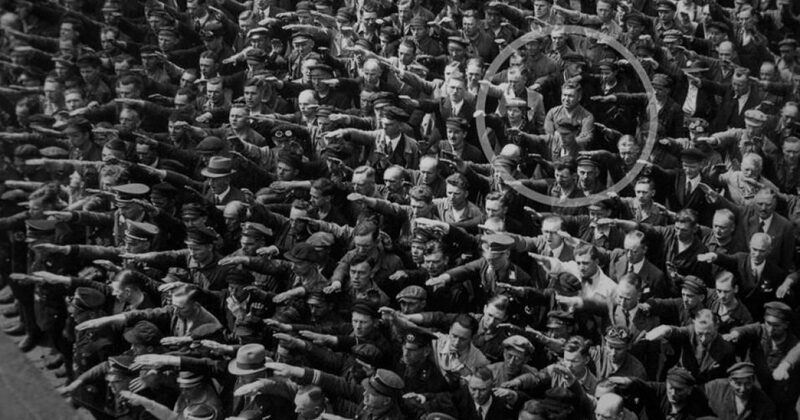 So, August Landmesser knew there could be consequences for standing there cross-armed, looking skeptical as Hitler spoke. 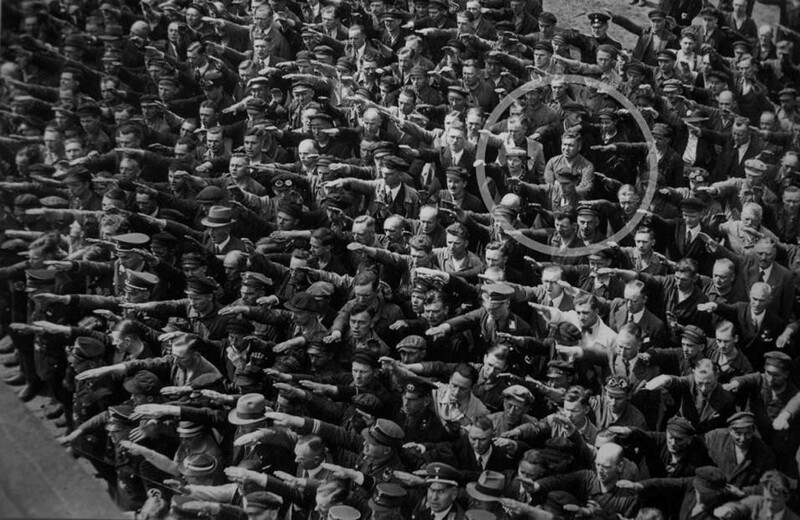 Nothing could have been easier for Landmesser than to go along with the crowd in that situation, but instead he showed the sort of moral courage that has people still saying “Be this guy” 80 years later. Incidentally, Landmesser paid a terrible price for doing the right thing. He was jailed, sent to a concentration camp and later involuntarily drafted into Germany’s military where he died. Meanwhile, his Jewish wife was sent to a concentration camp where she was killed. Thousands of workers had gathered at the World Trade Center to try to dig the bodies of their fellow countrymen out of the rubble. It was a sad and dispiriting time to be an American, particularly for those men. Into that scene walked George W. Bush. 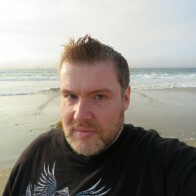 Note the head held high. It went perfectly with the quiet confidence and manly compassion he showed to these men. It also went well with his impromptu vow of vengeance on the people who knocked those buildings down. 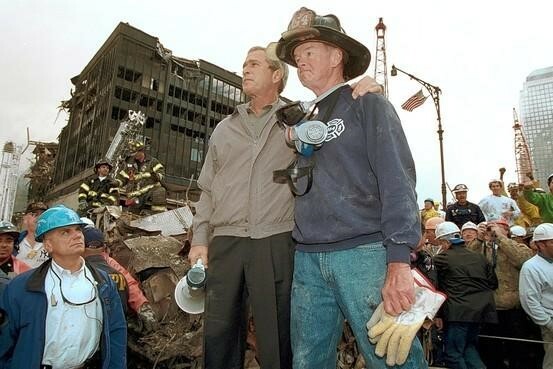 To this day, watching Bush’s 2 minute speech still gives me chills. There are a lot of daring people who have walked across a high wire between buildings, climbed mountains or hung from skyscrapers with no safety equipment. These are all gutsy people, but none of them have anything on Wesley May. He’s pictured here engaged in the first mid-air refueling of a plane. He handled that by WALKING OUT ON THE WING with a gas can strapped on his back and then CLIMBING ON TO THE OTHER PLANE. Keep in mind that it must have been doubly hard for May to pull this off because of the enormous swinging balls it must take to do something like that. 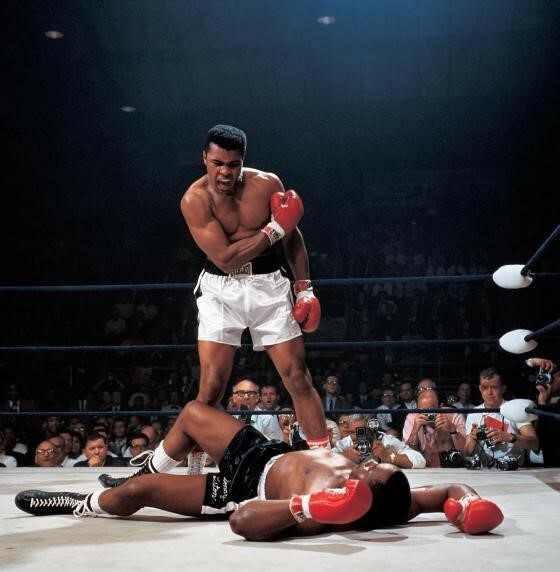 Muhammad Ali is generally considered to be the greatest boxer of all-time, but in his first title fight against Sonny Liston, he was a 7-to-1 underdog. Defying the odds, he beat Liston. Then, there was a rematch that many people thought he’d lose. Instead, he caught Liston with a surprise punch one minute and 44 seconds into the first round and stood over him screaming “Get up sucker” at a man who was considered the most feared boxer in the world before Ali came on the scene.